"Are you ready? Subatomic Sound (NYC) teams up with People's Records (Kingston, JA) for the first in a series of releases bringing together top Jamaican artists with top electronic producers worldwide. 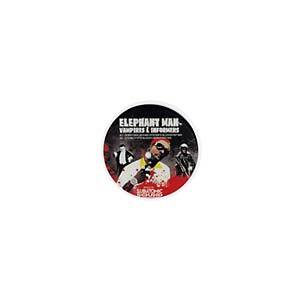 Kicking off with an extra loud bang, is the Vampires & Informers release, a rare look at Elephant Man, one of the world's top dancehall artists, vocally delivering a ferocious portrait of Jamaica's 'vampire' politicians, 'bloodsucking' informers, and the 'military society' of the ghetto youths. Originally a top selling limited edition 7" vinyl recorded with Sly & Robbie back at Kingston's Black Scorpio studios, here is Vampires & Informers resurrected and completely re-imagined with producers Subatomic Sound System, Dubblestandart, Stereotyp, Ming (of Ming&FS), & Kush Arora just in time for today's vampire-loving, blood-thirsting, electronic-obsessed youths to lose their minds at Halloween raves, block parties and dancehalls around the globe."